Thou shalt not “should” upon thyself. These are wise words that I would love to live by, but gosh, there are just so many “shoulds” in life. One area that is fraught with them is travel. I always feel like I should see all the major sights wherever it is that I am traveling. I have a friend who told me that she was once in Rome for a conference and instead of sight-seeing in her free time, she sat in her hotel room and read a novel. While I love that this is a permission slip to NOT feel the tyranny of the shoulds, I wonder if it isn’t a bit ridiculous? 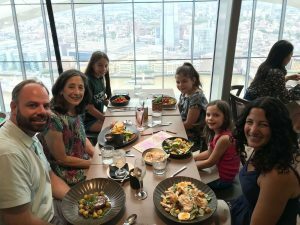 This summer my son-in-law, Scotty B., had a work opportunity in Ireland and so he and my daughter, Shana, and their three daughters left the US for the UK. Shana’s goal was to travel a lot while Scotty worked and invited me to join her and the girls for a week in London. Grateful that I was invited and grateful that such a trip is possible for me, I jumped at the chance. Major sights: National Gallery, Houses of Parliament, Tower Bridge, Tower of London, Westminster Abbey, St. Paul’s Cathedral, Big Ben, Buckingham Palace, Trafalgar Square, etc. Shopping and dining areas to explore: Oxford Street, Piccadilly Circus, Covent Garden, Regent Street, etc. New tourist attractions: Harry Potter Studio Tour, The London Eye, the Sky Garden in the Walkie-Talkie Building, etc. Day Trips: Stonehenge, Windsor Castle, Bath, Stratford-upon-Avon, Warrick Castle, etc. Must-see retail stores: Harrod’s, Fortnum and Mason, Hamley’s, Liberty London, etc. And don’t forget: theater, Abbey Road and all things related to the Beatles, not to mention all things related to Princess Di, etc. I am grateful that Shana took the lead in planning the itinerary. Since she was in Ireland as we worked on it, the logistics of talking to each other were difficult so we did not have the luxury of weighing choices endlessly. She chose a couple of sights to see each day, the restaurants at which we would eat, and stand-by sights for each day in case time permitted. Together we made advanced reservations wherever possible. The end result is that we saw a lot, though it was a thimble-full of all the many things there were to see. I saw my 12-year-old granddaughter act with aplomb and maturity – and no drama – when a restaurant water glass spontaneouslyshattered in her hand. I saw my 10-year-old granddaughter caught in the act of growing up. Sometimes she walked ten paces ahead of us and sometimes she sat with her head on her mom’s shoulder. Both versions were exquisite. I saw my almost 6-year-old granddaughter prove repeatedly that she is a good sport as she walked 9000-15,000 steps a day without complaint. 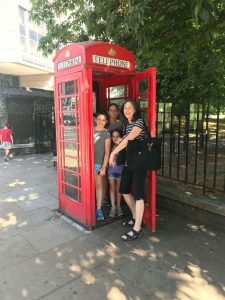 I saw that my daughter is a calm and capable woman who can easily traverse foreign cities with three children in tow – each with a backpack, roller suitcase, assorted dollies, and snacks in hand. And I saw that my son-in-law, who joined us for the weekend, has a great attitude about life. He was willing to get on any subway that opened its doors to us, insisting it was the right train, which it always was, but stating that the worst-case scenario was that we could get off and go in a different direction if necessary. 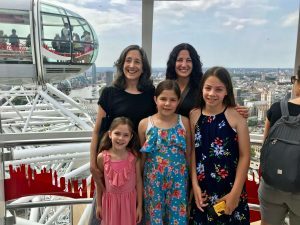 On our last night in London, as we lamented having to leave, my granddaughter exclaimed, “There’s still so much to see or we could just have fun in the hotel room!” And there you have it, the shoulds of travel reduced to its core element, doing what makes you happy! Such wisdom from a ten-year-old. Love all the things you saw, how sweet. Thanks, Lisa. Great trip. Great memories. Obviously I’m crying. Thanks, M. Beautiful post and I love the marmel perspective on the five things you saw on our awesome trip. I love the Marmel perspective, too. The top five things you saw in London, wow!!! I also love the Scotty B part about the trains — that’s me too, you know! What a great trip you had, and the memories all five of you will have forever! You are right! You and SB are alike in your decisive and confident manner. I hope to hang around both of you enough for a smidge of it to rub off on me. Rewarding, fulfilling trip for everyone. Glad it happened as it did. Great memories! Thanks for reading this and thanks for writing! Great memories, you are right!